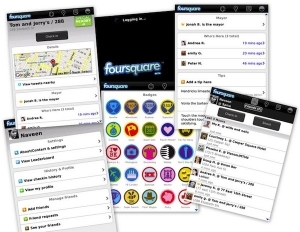 Foursquare for BlackBerry Beta 1.8.2 available now | BlackBerry Blast! Friends Page - Quickly see your own friends and discover new ones from your user profile page. Search - More prominent search. Now search is built into the top of the Places screen. "Me" Settings - Simplified user info & settings via the "Me" screen. You can now quickly manage friends, settings, and view your profile. My Check-in History - You can now view your check-in history from your "Me" screen. Connection - Improved connection support for a variety of carriers and corporate network configurations. UI - Updated UI including a unified look and feel. Small Tweaks & Fixes - foursquare is always listening to user feedback and making small fixes & tweaks along the way. For screenshots and more info see the source link below.